Next generation Aeon 1.2 GHz NMR system (Photo: Business Wire). 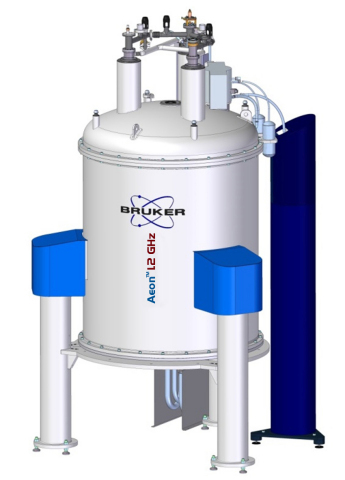 BILLERICA, Mass.--(BUSINESS WIRE)--Bruker (NASDAQ: BRKR) today announced five orders for ultra-high field (UHF) nuclear magnetic resonance (NMR) spectroscopy systems from Europe and Brazil in recent months. These UHF systems have been funded for cutting-edge NMR research in structural biology, intrinsically disordered proteins (IDPs), membrane proteins, macro-molecular complexes and interactions, cell biology, disease research, as well as in advanced materials research. The Federal University of Rio de Janeiro (UFRJ) in Brazil is expanding its existing structural biology facility with the addition of a 900 MHz NMR spectrometer. As one of the leading universities in South America, the new 900 MHz system will be available as a regional resource for research in protein structure and dynamics, protein folding and structure of nucleic acids. Professor Fabio C. L. Almeida of UFRJ commented: "Having a 900 MHz will have a strong impact on the development of NMR and structural biology in Brazil and Latin America. It will offer us advantages and capabilities over other techniques in tackling important biological and technological problems." In 2015, Bruker also has received two additional orders for next-generation GHz-class systems from France and Germany, and Bruker’s backlog for GHz-class NMR systems has now increased to nine (9) systems for different European and Canadian customers. Bruker expects to begin to recognize revenues from next-generation Aeon™ 1.0 GHz systems in 2016. The Aeon 1.2 GHz systems backlog is projected to ship over several years, starting in late 2017 or 2018. Revenue timing for future 1.2 GHz systems has inherent risks, and depends on further progress in high-temperature superconductor (HTS) materials and HTS-based NMR magnet technology. The Center for Biomolecular Magnetic Resonance (BMRZ) at the Goethe University in Frankfurt, Germany is part of the European Large Scale Facilities and incorporates various high-field liquid and solid-state NMR spectrometers, as well as DNP-NMR and EPR instrumentation. The 1.2 GHz NMR ordered recently is expected to be available to the scientific community in Germany and Europe. Research at the BMRZ is dedicated to the elucidation of structure and functional mechanisms of biomolecules ranging from RNA and RNA-protein complexes, via large protein complexes to membrane proteins. Professor Harald Schwalbe from the BMRZ remarked: "We are very happy to have placed the order for the next generation of NMR. The 1.2 GHz NMR system will allow us to investigate structure, dynamics and biological function of increasingly large and challenging biomolecular complexes. We will also be able to provide access for European researchers." This press release includes forward-looking statements within the meaning of the Private Securities Litigation Reform Act of 1995. Forward-looking statements may be identified by the use of words such as “anticipate,” “believe,” “expect,” “will,” “may,” “estimate,” “plan,” “outlook,” and “project” and other similar expressions that predict or indicate future events or trends or that are not statements of historical matters. Such forward-looking statements reflect the views of management at the time such statements are made and are subject to a number of risks, uncertainties, estimates, and assumptions that may cause actual results to differ materially from current expectations. These statements include our expectations related to the production and delivery of technologically advanced UHF NMR systems and the amount and timing of future revenues from UHF NMR systems orders currently in our backlog. Although we believe the assumptions upon which these forward-looking statements are based are reasonable, any of these assumptions could prove to be inaccurate and the forward-looking statements based on these assumptions could be incorrect. Our actual future performance may differ materially from such expectations as a result of important risk factors, which include, in addition to those identified in the our Annual Report on Form 10-K for the year ended December 31, 2014 and our other subsequent filings with the Securities and Exchange Commission, risks and uncertainties associated with our ability to develop high-temperature superconductor (HTS) materials and HTS-based magnets required for 1.2 GHz NMR systems. These risks and uncertainties could cause actual results to differ materially from those stated or implied in these forward-looking statements. We expressly disclaim any obligation to update or revise these forward-looking statements, except as required by law or regulation.